Recently I put together my ideal workstation build. 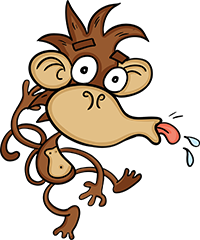 As a software developer, I spend a lot of time with power hungry software like SharePoint, VMWare, SQL Server and Visual Studio to name a few. These apps often need raw CPU power, fast disk access and a bucket load of RAM. With the release of the new x299 Skylake-X from Intel, I decided it was time to upgrade my old x5960 Xeon based system, which has served me well for many years. First launched in 2011, this chip by today's standards is old, but IMHO performed so well, there was little reason for me to upgrade...until now. Now I know there's a heap of good articles on gaming builds, showing all sorts of wonderful graphs about how many frames per second you get at 2k on an array of awesome games. Unfortunately, I don't get too much time for games these days and as I'm building my primary workstation, this is a powerhouse build, but with a good dose of gaming ability thrown in. I thought I'd document what parts I chose and why, the performance, cost and other factors. To kick this post off, let's get the obligatory coke can shot out of the way. 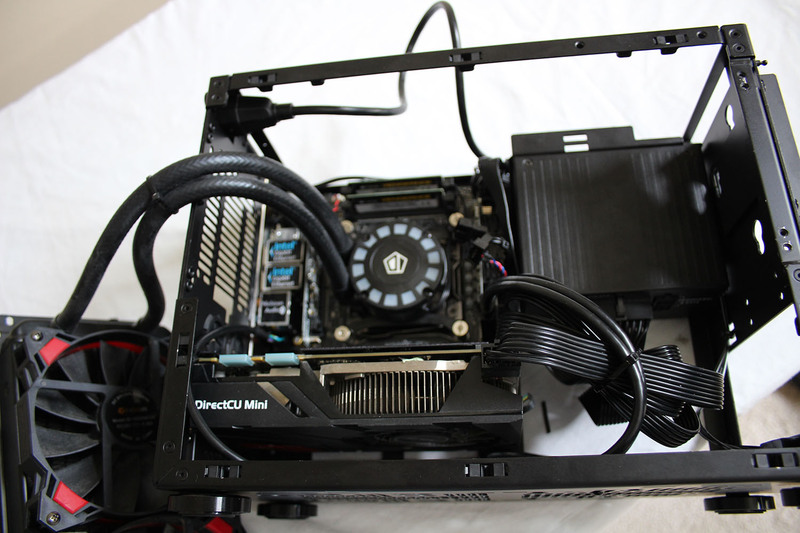 Initially I had decided on getting a 240L Glacer expandable AIO, as I liked the idea of water cooling the GPU and I really didn't want to get into a full loop. 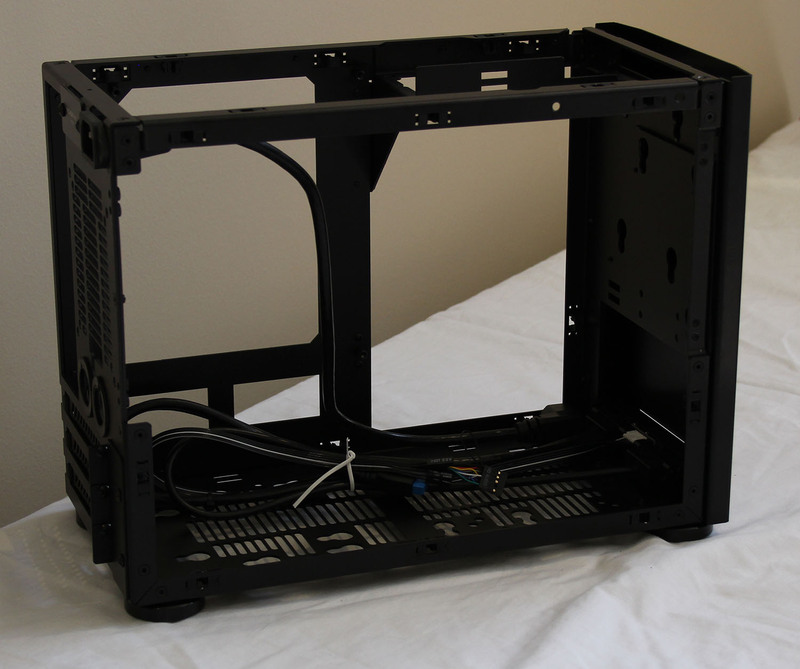 I picked this option as its the only expandable AIO that had been confirmed to fit in this case that I could get. Even though I managed to get one that had never been used, when it arrived I found that all the fins of the rad had gone rusty :(. I then thought about small oxidizing iron particles being pushed onto the motherboard beginning a chain reaction of corrosion on very expensive electronics. At that point I felt nauseous and then opted to re-use my existing ID water cooler and I'm glad I did. 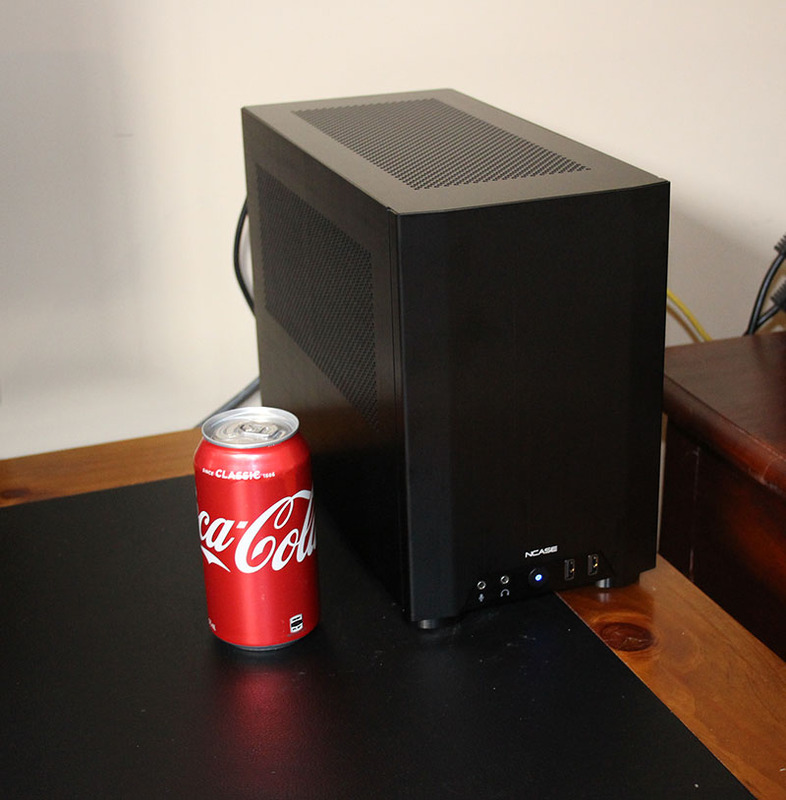 It's dimensions fitted perfectly in the Ncase M1. Read more about this. There's nothing big or flashy here, just an unpretentious, straight up, no nonsense classy design. The front panel contains a single power button on the bottom edge, which makes efficient use of space by containing both the Power and HDD LED's. On left and right side of the power button are the audio jacks and 2x USB 3 ports respectively. It has a 1.5mm aluminum brushed and anodized exterior with a matte black painted interior. The front, top, left and right panels of the case all pop off without much effort. No screws, levers or latches. I know not everyone will like that, but for me, I think it's great. 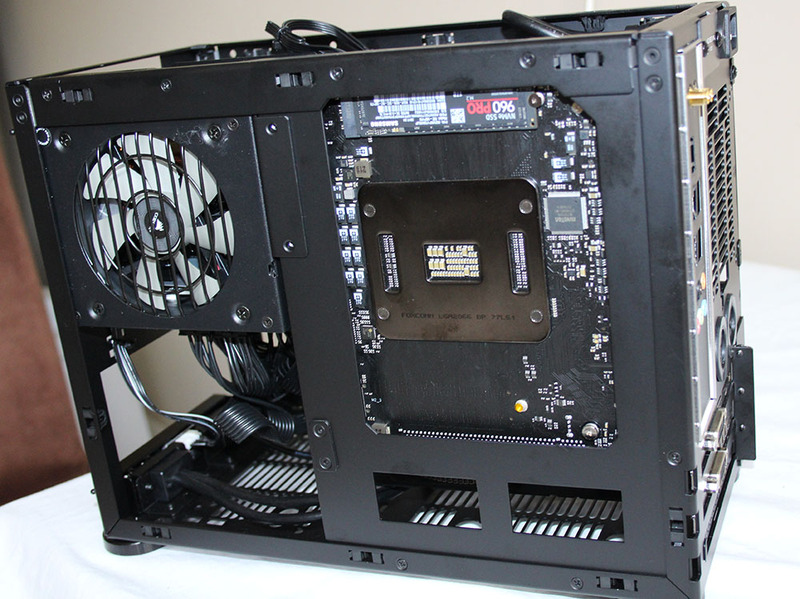 There's also a space for a rear 90mm fan, and in the box are a bunch of fan covers and filters. 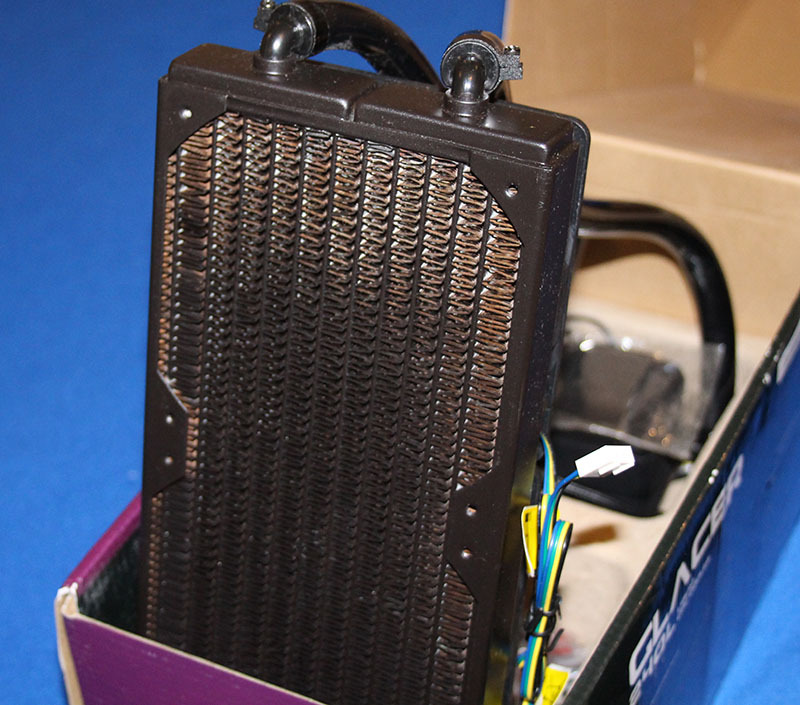 Another aspect of this case that is not immediately obvious, is how well it breathes. The left, top and right panels have a large vent surface, while the floor has a large cut out lattice supporting fans, hard drives or even a radiator. One of the things I was concerned about in the planning of this build was the air flow and ambient heat build up. Read more about this in the Cooling section. As I mentioned above, my initial pick of the Glacer 240 didn't pan out. However looking at the size of the radiator and thickness of the tubing, I'm glad I went with the Frostflow. The tubing would have had to be cut down and the space between the radiator fans and the rest of the components would have been very tight. Normally in any build, I'll look to put almost as many exhaust fans as I have intake fans, keeping a slight positive pressure in the case. This helps to avoid dust being sucked through cracks and gaps in the case, buttons etc. But this build for me was all about small, light and quiet. The less fans the better, low noise, less weight, more room. So I decided to leave just the 2 120mm fans on the Frostflow as air intake with no exhaust fans. Thing is, I was a little worried the ambient temp would rise within the case and slow cook everything. Great on a BBQ, awful in a computer. I was hoping that the large amount of venting in the NCase M1 would pay off here and it did. While I don't doubt I'd get better air flow with an exhaust fan, and more overclocking head room, that's not the point of this build, in fact I don't plan to overclock at all, because, well, TBH I don't need to. So that means less heat, less fan noise, more sanity. The ID Frostflow 240L isn't one of the big players, but I think its highly underrated (Although it has had great reviews). I picked this up on eBay for around $100 AUD, far less than any other brand of the same size, and it's been awesome. The fans are quiet and keep things cool at even low speed. The radiator isn't as thick as some, but in this case that's a plus. It also has a nice cylon style LED that trails around the circumference of the cooler, just to let you know that it's biding its time and that one day computers will rise up and take over the world. I said before that the fans are quiet, however they do get noisy as they speed up. The question for me was, can it keep the system cool while at full load and still remain quiet? I decided to do some stress testing to find out. Here's a picture of my current CPU profile based on the "Silent" mode in the motherboard. The lowest speed of the fan is around 1000 rpm which is a barely audible hum. From the numbers you can see that we were about 18 minutes in before the temps rose and leveled out. The fans never went above their level 2 settings, which is only slightly more noticeable compared to their lowest speed. While I didn't have any way to read the fan or temp of the SF600 Power Supply, I took a look at and it was spinning slowly, although I couldn't distinguish any noise coming from it, it was definitely quieter than the Frostflow fans. At a peek power usage of 231 watts under full load, the SF450 would be a more efficient power supply, but I'm happy I got the SF600 as I like to have a bit more head room, especially if I want to put in a power hungry graphics card later. 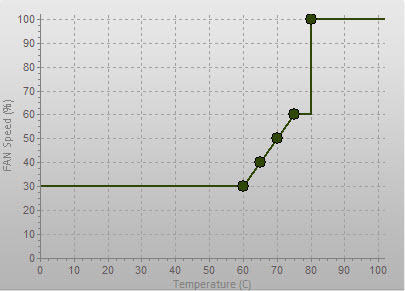 The motherboard temp rose by approx 10°C and leveled out at around 52°C/125°F. One of the problems we might find using a water cooler is that there is no localised fan on the CPU to disperse heat around the board and heat sinks. Interestingly I found that one of the intake fans was positioned almost directly over the motherboard and even though it's warmer air having passed through the radiator, it still moved the ambient heat from the motherboard. 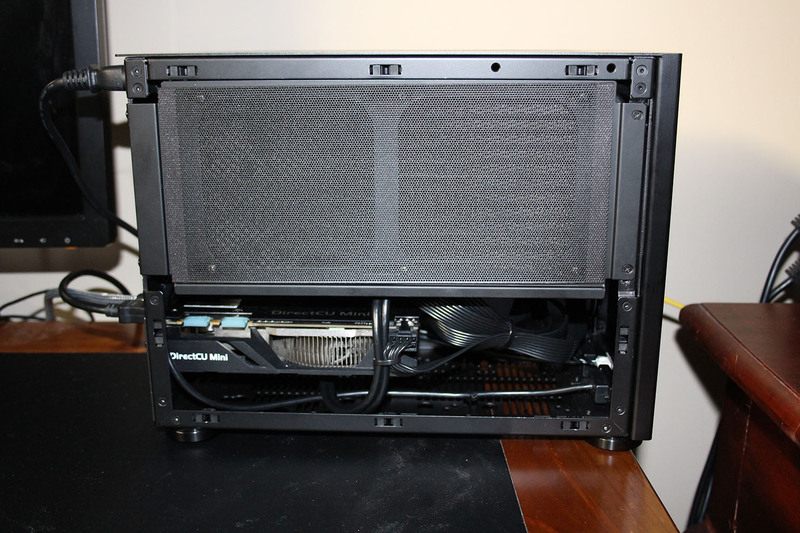 In addition, the second fan positions directly into the Power Supply intake (if you have it that way round). So to the question, Can the ID Frostflow 240L, keep the system cool and remain quiet under full load? It most certainly can. The Skylake-X must be far more efficient at dispersing heat (or not getting as hot) as my x5960 Xeon, which under full load would easily get to 80+°C/176°F with the same ID Frostflow, which was also in a bigger case. Building a small form factor system has its own challenges. Every part you pick has to fit, often with little clearance and mistakes in the parts you order are costly not to mention frustrating. Including water cooling on a case this size adds to the difficulty, especially when trying to keep the whole thing cool, not just the CPU. Initially I looked at getting a full length GTX 1080, although not all would fit there are definitely a bunch that will. Partly for cost reasons I decided to reuse my existing ASUS GTX 970 DirectCU Mini. This card is a great gaming card IMO, even though ASUS fudged the numbers and got themselves in trouble with it. 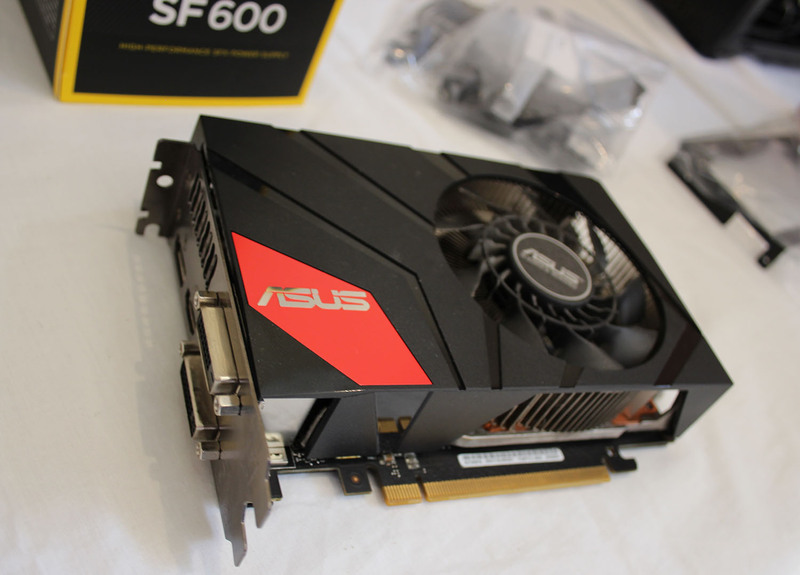 This card being an ITX size card, made things a heap easier. Even though it's quite low profile, the wires from the power connector on top only just fit in. The other thing that this helped with was the SF600 cables. The cables are quite stiff, and if my card had gone all the way across I'd have had to be more creative with the cables. This was part way through the build, and it was nice having the space next to the GPU for the cables coming out of the SF600. There was a noticeable increase in GPU temp running a game. In my old Micro-ATX this card would run around 65°, however it pretty much stays between 75°C/167°F and 80°C/176°F. I attribute that to a smaller space where the ambient temp is higher, and less air flow. A newer Zotac 1080 Mini would have been a great part for this build. 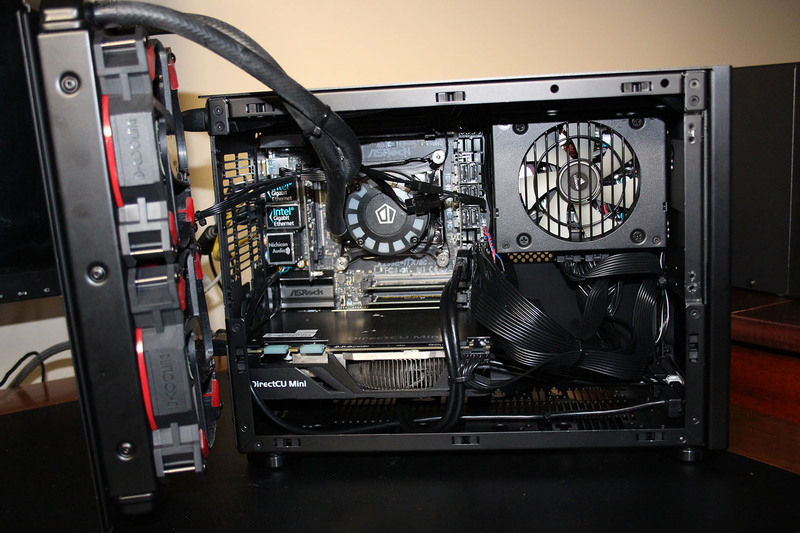 Braided/sleeved cables, cut down to a better size. The Asrock X299E-ITX/ac is the only x299 in the Mini-ITX form factor. Supporting quad channel memory, Bluetooth, Wifi and 3 M.2 slots, it was my single best choice for a true Mini-ITX powerhouse. Unfortunately I couldn't get this board in Australia. Only recently released, I had to order from NewEgg. One thing I hadn't realised is that it doesn't come with a TPM, only a TPM Header. If you want the TPM you need to buy it separately, oh and I couldn't buy this in Australia either. It's not hard to work on this board, although none of the headers are labelled so you'll need to consult the manual to figure out where everything goes. One issue I had was there is very little room between the power supply and the board, which is where the fan headers are, and I ended up taking out the power supply (and bracket) multiple times. My advice is to put the power supply in at the end, and if you want the air intake on the power supply to face inward you'll need to plug in the extension cable before you screw it in. Initially, and in the pic above, I faced the power supply air intake outwards, figuring its better for it to pull fresh air direct from the vented side panel. That may still be the case, but I opted to turn it round and let the 120mm Frostflow fan push air towards it instead in the hope that some airflow across the heat sink will keep the SF600 fan off under normal usage, however it doesn't seem to. Another reason to face this inward though was that there is a magnetic filter on the outside of the radiator bracket, reducing dust. I used the Arctic Silver 5 thermal compound on this as I've always had good results from it. I know most people do the blob method, but I've seen it when the blob doesn't spread out far enough. So my approach is called the Lego Paintbrush method (I just made that up). I get a long piece of Lego, and carefully wipe the compound over the CPU using the small edge, aiming for a thin even layer. This takes longer, but at least I know its across the whole CPU. Trick here is not to make it too thick or you'll find it oozing over the edges of the CPU, which you definitely want to avoid! 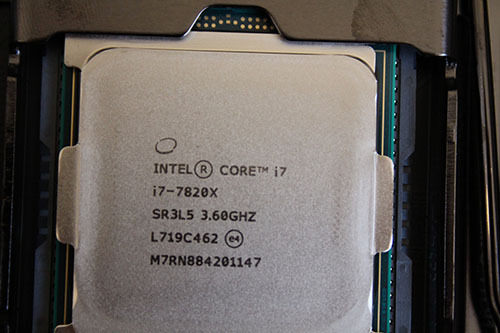 Check out the Benchmarks to see how this CPU measures up to the rest of the world. 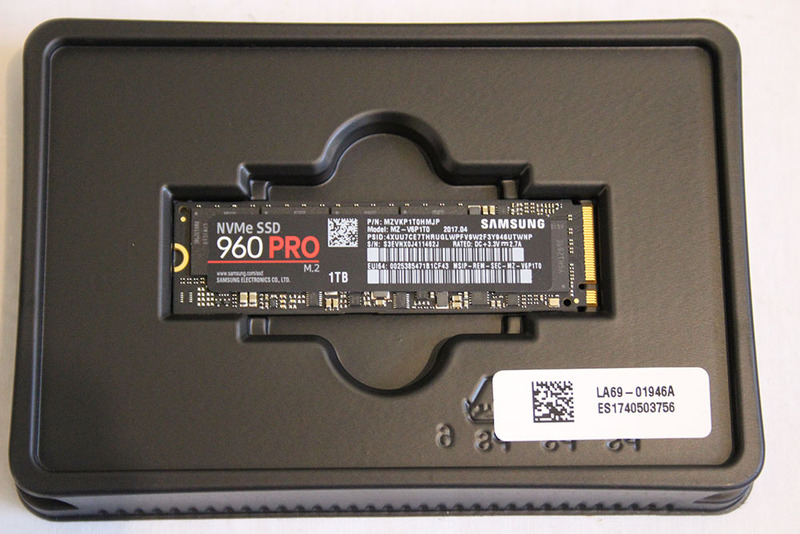 I went for the Samsung 960 PRO NVMe M.2 1TB SSD, because I wanted this PC as light as possible. Sure a 2.5" SSD or 2 wouldn't way much but it all adds up. After reading about thermal throttling issues, I thought about mounting this on the little riser card on the front of the board so I could slap on a heat-sink, but then I read that the 2 M.2 slots on the rear of the board are tied directly to the CPU, whereas the one on the front isn't. I didn't know what that meant but it sounded very clever, so I put it on the back. When it's in the M1, its just along the top edge of the vent, which I think will help with heat, but there's no room for a heatsink or fan unless you use the M.2 slot on the riser. 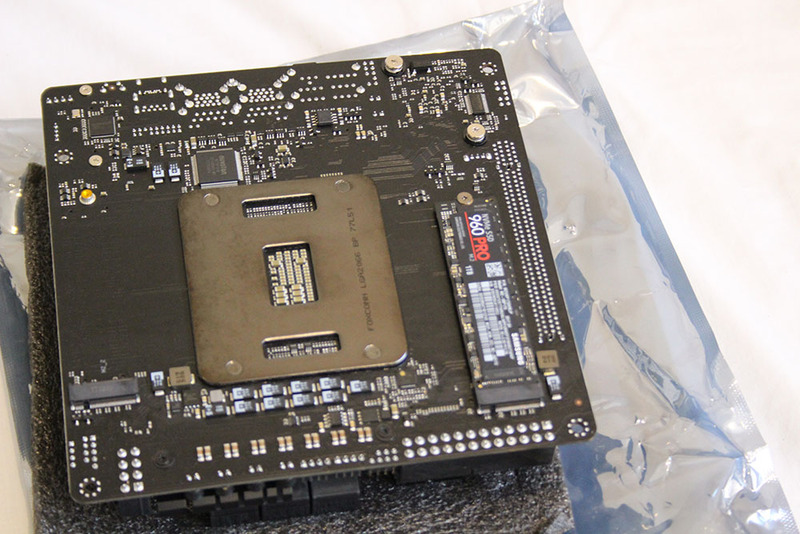 If you look to the lower part of the board you'll see another space where a second M.2 can be installed, and without having to remove the motherboard. That's an easy upgrade! In the end, a SSD like this will make this PC hugely faster for serving up Virtual Environments or loading large dev solutions. But let me be honest, this is complete overkill, and I love it! My approach to measuring sound is quite technical. I put my ear close to the PC and see if I can hear anything. There are a total of 3 fans in this system, the 2 that came with the ID Frostflow 240L, and the one in the SF600. Firstly the SF600 is awesome. It doesn't spin at all on low load, and when it does spin, I can't hear it. Secondly, the fans from the ID Frostflow are audible but barely noticeable between 1000-1400 rpm. During the stress testing, these fans did not exceed 1337 rpm, after 30 minutes at 100% CPU load. The only gripe I have is there is no way to tie against the top edges of the case and I found a couple of cables I needed to run along there. There are enough tie points throughout the rest of the case. The SF600 cables are stiff and the plugs are difficult to get into the modular connectors. They are even harder to get out. If I had more time, cutting the cables to a better length and sleeving them would have been awesome, and I may still do that one day. I've not overclocked this PC at all, everything is default except the fan profile, which I reduced to Silent. 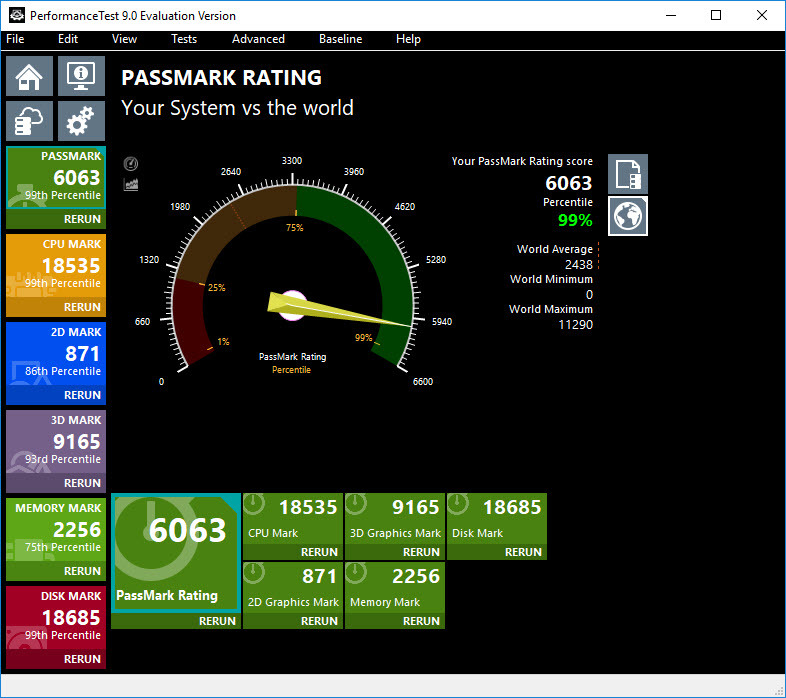 Every time I build a new PC, I'll download and run Performance Test from Passmark on it. The only thing I'd have liked to improve here is the memory speed. 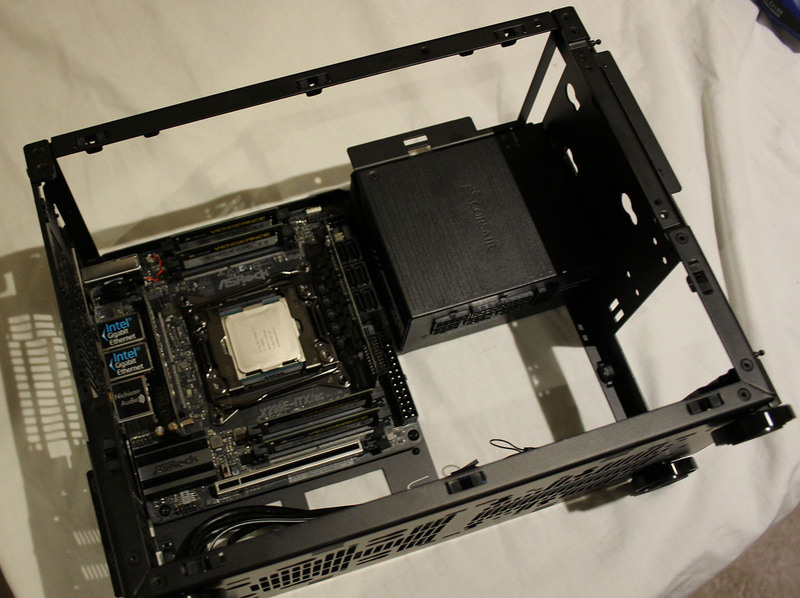 Unfortunately, 8gb SODIMM memory sticks faster than 2400 mhz were not available in Australia when I was building this. Perhaps I'll look to upgrade this later. Considering the GTX970 is an older card, to still be in the top 93% is pretty good I think. Thought I'd compare how well this PC works with Visual Studio against my last workstation. So taking the fastest time from both computers, the 7820x is 43% faster. Not bad. I'm not setup to provide the myriad of benchmarks like you see on a GPU review, but here's a comparison between normal operation and running a game. I ran Starcraft II for 30 minutes, then took these readings. I decided to go for this build as I want to have a more portable desktop, instead of buying an overpriced laptop that would perform worse than my 6 year old dev desktop. The unit is light and the completed build comes in at 5.5kg/12 pounds and you could easily pack it in your luggage. A custom bag for this is even available on the NCase site, but doesn't seem to be order-able at this time. If you were going between offices, or having a working holiday then this build would be great. I figure if I did that I'd probably rent a monitor at my destination and just bring the rest. I think any good PC needs to have all its components working together in harmony. From a case with good cooling and cable management, to a full featured stable motherboard, fast RAM and storage and of course a decent CPU geared towards your type of workload. If gaming's your thing then a good GPU is a must. Calling this PC a High End DeskTop (HEDT) really didn't seem to give it justice, I think Ultra High End DeskTop (U-HEDT) is more fitting. It's fast, quiet, light and compact. 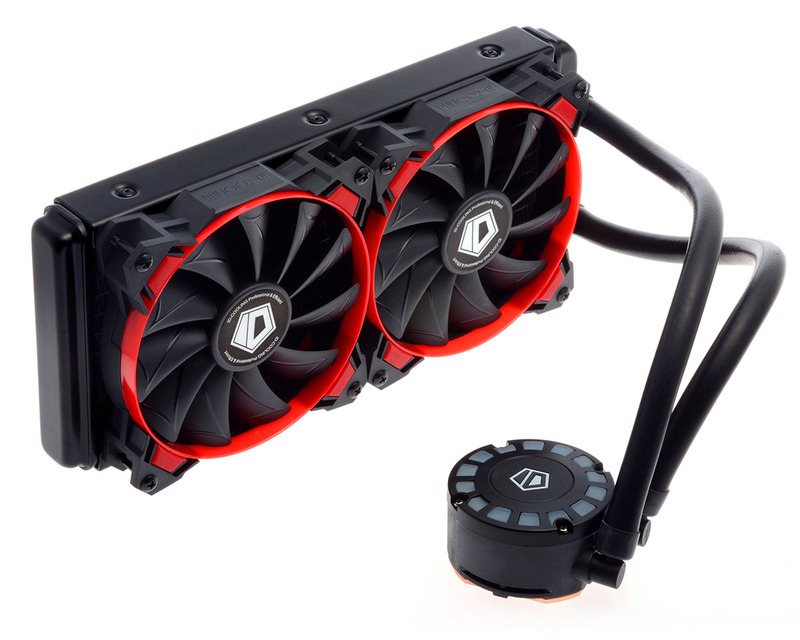 The AIO water cooler performs well and doesn't have the difficulty of a full loop, plus I hope to travel with this little beast, and a full loop would add more challenges. I took the easier road in this build by using the Mini GPU and a single M.2 mainly to make it lighter, but the end result was less devices to wire up and more room for the cables coming out the back of the SF600 power supply. 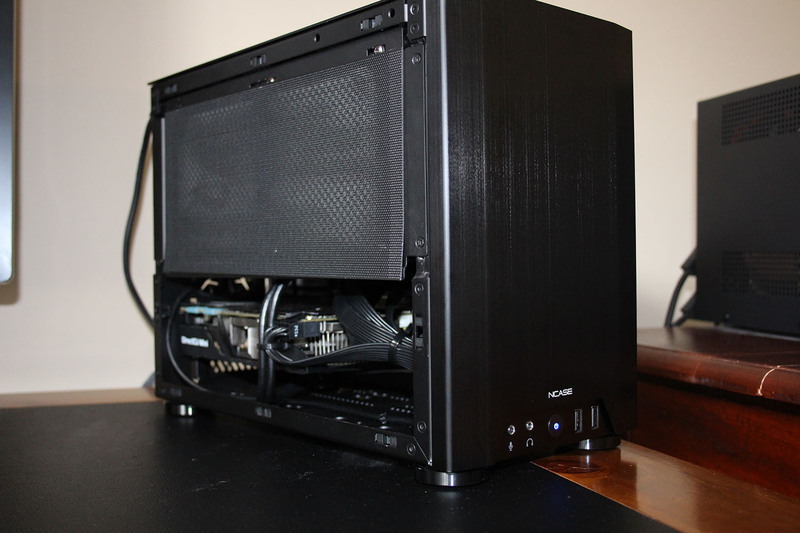 The case and small form factor power supply are an awesome combination, although combined are pricey, but if you are doing this type of build, price isn't really the main factor. For what it's worth, this build cost around the $3.5k AUD / $2.6k USD, and I've included the GPU and Water cooler in that. Still cheaper than a high end laptop. If you are planning to use this case, probably goes without saying, but I'll say it anyway, check the measurements carefully, and if using a full length graphics card, you can't use an ATX size power supply. Also be prepared to bend the cables or put some more money into 90 degree connectors. This PC was super fun to build, and really satisfying seeing the end result of huge performance, small footprint and very low noise. There's a few things I'd like to do better, like a Zotac 1080, faster ram, and shorter sleeved cables. But for now, I'm done. It's small enough, who knows, I might take it travelling with me and show it the world.